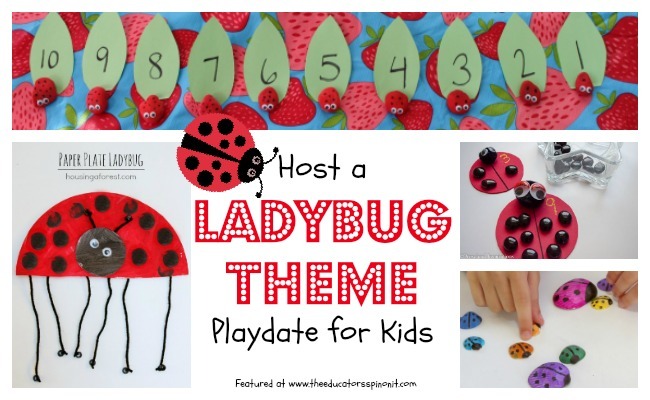 This summer, host a Ladybug Theme Playdate for your preschooler and their friends. Select a ladybug craft, learning activity, and book. Prepare your stations and have fun! Note: The links to blog articles pictured from our blogging friends have an * Affiliate links to products are also included in this post. 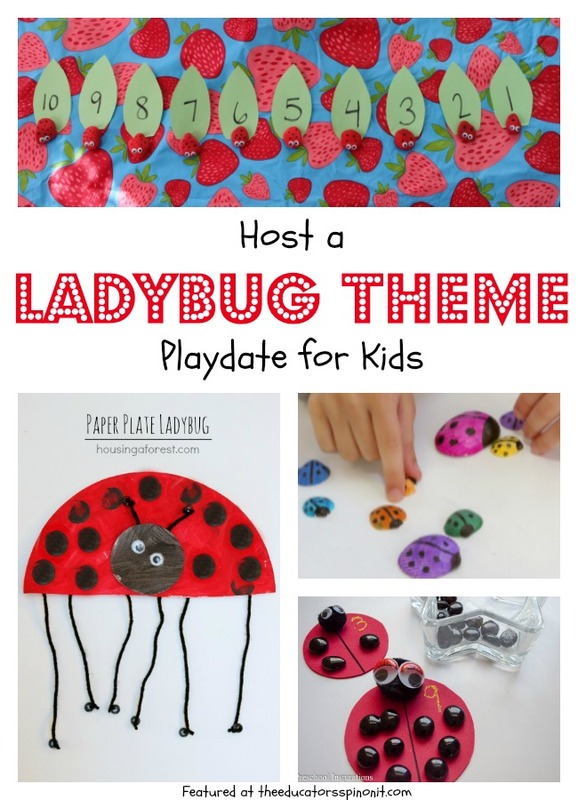 Make a super cute paper plate ladybug craft *. Black pony beads ~ This is a great addition for older children to work on fine motor. Skip this step for 2 and 3 year olds. Dye a set of shells the week before your playdate to give the shells time to dry. You “could” do this during your playdate as a craft, but it is messy! Then add in the head and spots to make your lady bug sea shells*. During your playdate, let the children hide the lady bugs and take turns finding them in your backyard. If you want to tie in math, hide a specific number, such as 12 ladybugs. Then have the children search until they have found all 12. You can make a set of numbered leaves * and set your ladybugs on them as they are found. Call out the numbers as the insect is set down. Count them all and hide again! In this ladybug counting activity*, children select a numbered ladybug and place the specific number of black gem spots on the ladybugs. You could make multiple sets of ladybugs and let each family take a bag home to continue learning and counting throughout the week. Are You a Ladybug? This delightful tale describes what a day would be like if you were a ladybug. Ladybugs This book is also a non-fiction reader for kids all about ladybugs. From facts about their characteristics to the role they play in our environment, children will be sure to learn something new about this bug! Ladybug This short, non fiction reader, provides children with basic facts about a ladybug’s life cycle. 16 pages. What a darling and creative party. I loved all of your ideas and the fact that you used the book Ladybug Girl as your inspiration. I have enjoyed reading your past posts. We LOVE books in our family as well. I don't think you can ever be surrounded by too many books. Thanks for participating in my "All Things Wonderful Link Party" and I hope that you will join us again this week. What a cute party theme! I love the costume.